Mellan september 2015 och juli 2016 sändes fyrtio avsnitt av podden Åsikt – en krönika av och med Thomas Barregren. Detta är en återutsändning av avsnitt 36 från den 24 maj 2016. 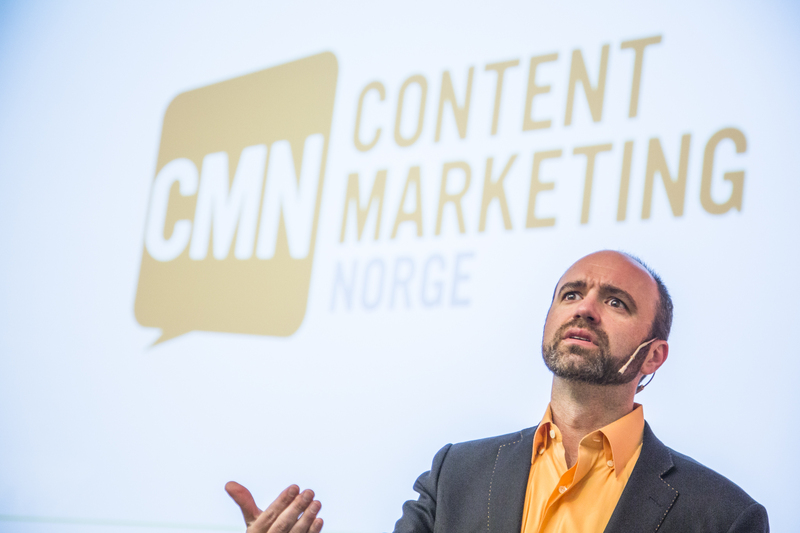 ”Joe Pulizzi om skillnaden mellan content och content marketing”, handlar Åsikt 36 från den 24 maj 2016. Joe: Do we run out of time? Thomas: I’ve forgot to record. Joe: Are you kidding me?! Joe: I got only five minutes. Joe: That was good stuff!! That’s okay! We will bring it around. Joe: It has happen me too. I’ve done it before. We got halfway through our podcast and have to start over. It was horrible. Thomas: Now we are recording, yes. Joe: We are for sure recording? Thomas: We are recording now. Thomas: In your presentation you said that nine of ten companies self-report that they are doing content marketing. But I sense an undertone that you don’t really trust them on that. Joe: That’s total correct. I think that most people that say they are doing content marketing are just creating content. They are putting it on all sorts of different platforms, and there is no strategy or business model behind that. So, we call it the approach of content marketing. So that really means, that are goal is to create valuable, relevant, consistent content on a ongoing basis, in order to see some behavior change to a very target audience. So there is a couple of tings in there. A very specific audience. It has to be valuable content, and not about our products. And we have to do it consistently. It just like a medium company would do, except for that we are not getting advertising revenue or paid subscriptions like a media company would. We are actually try to sell more products and services, help close the business faster, create more successful customers in some way, so they ultimately do more profitable things for the business. I would say there is very few people out there doing it. And if you look at our success rate in the research of 30 percentage, that is probably more accurate. It might even be lower than that. That [is] companies that are actually doing content marketing are seeing success. Because you got all kinds of companies out there that has no strategy, they are not targeting a specific audience, they are still talking about their products and services too much. They are all over the place on social media and are not building their own platform where they can earn attention over time. They are not building an email subscription list. So they are doing all this content. There is lot of activity. But all that activity [is] at the end of day [all] what you have. The approach of content marketing, and a business model behind that, would mean that you have an audience that is opt-in to your communication. That is you have earn their trust – they know they can trust you – and they are more willing to buy from you. And that’s what we like to see. There is definitely not 90 percentage of companies doing that. Probably less than half are doing it. You have lot of experimentation. Even though content marketing is a very old discipline, it’s new to most people. I think if you come from a publishing environment, you get this. If you are a marketer, and you’ve been doing advertising for 50 years, this is a very new model. The old model is campaign based. The new model is a marathon, and not a sprint. We need to focus and solve our customers communications challenges on a ongoing basis; giving them amazing experience so that they trust us, and then we can monetize that once we give them enough value. Thomas: In Sweden a lot of discussion have been about whether or not you have to own the medium you are putting he content on. Many say you don’t have to do that. You can do native advertising and call it content marketing. Do agree or disagree? Joe: Native advertising is advertising. We are still… I’m not saying interrupting. We are telling stories that are more compelling, hopefully, than [traditional] advertising, but we are still renting somebody else’s space. So if we are going to do native advertising – which I don’t have a problem with – at the end there has to be some kind of result. Are we trying to steal audience, and get them go to our site? Maybe. That’s hopefully what we try to do, for at the end of day we got to have some subscriber – we are trying to build an audience in some way. Same thing if we look at social media platforms of some kind. We are renting other peoples platforms. So we have to wake up everyday and knowing – whether we are using native adversing or whether we are using YouTube or Facebook – those things are temporary. We don’t have control over those things. So what’s our goal and call to actions, so that we at the end of day have an audience that does know, like and trust us, so we can monetize? Even great advertising is done consistently over time. The problem is that most advertising program stop at some point – 9 months, 12 months, whatever – and then we start a new campaign, which is horrible to do. No media company would ever do that. So, if we can deliver value over a long period of time – if you are looking at any media company or any content marketing case study – if we do that, and they know, like and trust us, we have created a better customer. We see more positive behavior. So whether you call it advertising or communication, that’s the basis of it. Whatever platform you are using or what you do, all of I want to make sure of is at the end of day you are saying that this content is valuable. You can’t build an asset out of content, I don’t believe. I think the asset comes from building the audience. The content is a conduit to get to the audience and earn that trust and communications. Berätta vad du tycker om Åsikt. Vad gillar du? Vad kan göras bättre? Skicka ett mejl till thomas (med th) snabel-a kntnt.se. Overcast är en annan bra app för iPhone och iPad. Den är gratis att ladda ned, men det kostar några tior att bli av med reklamen. Bilden överst på sidan © Esben Johansen.